Juno accomplished a close flyby over Jupiter’s churning atmosphere on Wednesday, February 7, successfully completing its tenth science orbit. The closest approach was at 6:36 a.m. PST (9:36 a.m. PST) Earth-received time. 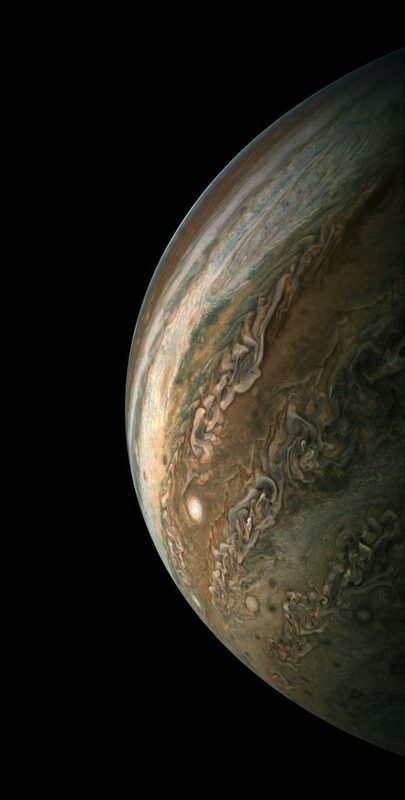 At the time of perijove (the point in Juno’s orbit when it is closest to the planet’s center), the spacecraft will be about 2,100 miles (3,500 kilometers) above the planet’s cloud tops. This flyby was a gravity science orientation pass. During orbits that highlight gravity experiments, Juno is in an Earth-pointed orientation that allows both the X-band and Ka-Band transmitter to downlink data in real-time to one of the antennas of NASA’s Deep Space Network in Goldstone, California. All of Juno’s science instruments and the spacecraft’s JunoCam were in operation during the flyby, collecting data that is now being returned to Earth. Be the first to comment on "Juno Spacecraft Completes Tenth Close Flyby Science Orbit of Jupiter"